WARNING: This ebook will get you noticed. If you want to live in anonymity and obscurity, this is not the book for you. All the great performers relied on publicity - so should you. 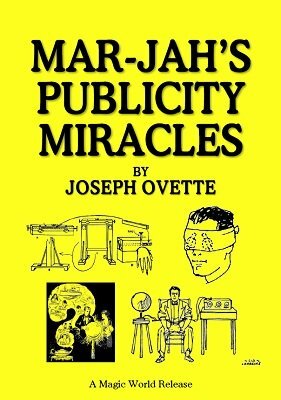 Get your name and photo in the newspapers, TV and on Internet media sites using the attention-getting stunts in this book. No matter whether you're a mentalist, magician, illusionist, juggler, comedian, or any other type of entertainer. You need a constant barrage of publicity and "buzz" to ensure that your shows are well-attended. And that's just a partial list of the effects and publicity-generating stunts included in this giant volume. There's also an entire chapter on the advertising materials used by all entertainers. Examples of actual posters, bills and heralds used to announce the upcoming performance are given. Newspaper tie-ups are covered in detail, which is another great way to obtain free publicity and ensure a packed house. Included, for the first time in any book, is the routine and method of Alexander ("The Man Who Knows) for his Supreme Thought Projection act. Editor B. W. McCarron includes a section on press releases, providing a valuable primer for entertainers that will get your notices published. Learn the secrets that big companies use to have their advertising copy turned into news to create buzz ... and it won't cost you any more than the cost of a stamp. The book has been massively rewritten and updated, with scores of edits, corrections updates, and additional illustrations. Completely reset in new type for easy reading. 1st edition 1928, 1st digital edition 2017. 185 pages.